We are a team and we succeed as a team! Full time employees participant in Varen’s company bonus program each year which is based on the company’s overall profitability. Additional bonuses can also be earned based on an employee’s participation in acquiring new business and activities that support the company’s bottom line. Each employee receives a minimum of 20 days Paid Time Off (PTO) during the first year of employment with Varen. Additionally, we observe 10 paid holidays for a minimum of 6 weeks of leave in the first year! Work life balance is important to us! Flexible work schedules may be available to allow you to best meet the needs of your family and the clients we serve. We care about your future! Varen Technologies provides a 401k plan that is employee/employer funded. 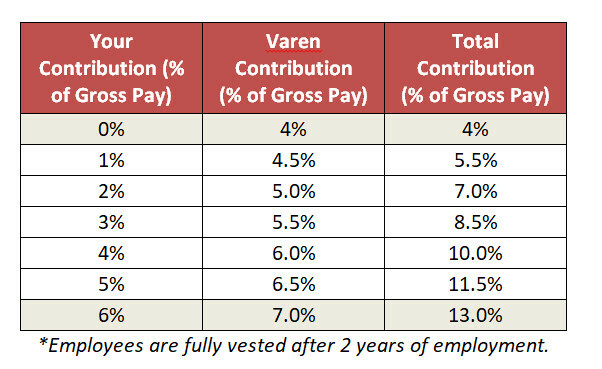 Varen contributes 50% of an employee’s contribution up to 6% of his/her annual salary. Varen Technologies not only supports, but encourages professional growth. We provide up to $5,000 towards educational reimbursement annually. Association Memberships – employees are encouraged to be an active participant in a professional association affiliated with their chosen field. Varen pays the annual association membership fee on behalf of the employee. Varen Technologies offers comprehensive coverage including medical, dental, vision and prescription benefits. Varen Technologies offers a Health Care Flexible Spending Account and Dependent Care Flexible Spending Account. The Health Care FSA includes a debit card, while the Dependent Care FSA is reimbursed through direct deposit or check. Short Term Disability – provided by Mutual of Omaha. Mutual will pay 60% of an employee’s weekly salary, up to $2,500 per week, to a maximum of 13 weeks. Long Term Disability – provided by Mutual of Omaha. Monthly payments are 60% of employee’s monthly salary not to exceed $7,500. Life Insurance – provided by Mutual of Omaha. Basic life insurance of 1x your annual salary to a maximum of $350,000 and a minimum of $100,000 is provided at no cost to the employee. Like attracts like. At Varen Technologies, we seek out people that match our principles and work to place them in a position they enjoy. We support and value the ability to hire colleagues you recommend. We offer a $5,000 bonus for referrals of fully cleared candidates who are subsequently hired by the company. Varen Technologies actively pursues to be involved in the communities that we live and do business in, as we believe that our involvement directly affects who we are as a company. Bike teams for charity, AFCEA events, support for Dogs for Deployment, Baltimore Station Chili Cook Off, Angel Tree, Toys for Tots, Race for the Cure and so much more are all part of our repertoire to support our community. If you have an organization that you are personally involved with, we can see how Varen might be able to support you in your community service efforts as well! Free Clothes! Each employee receives an “allowance” to spend at the Lands’ End Varen Company Store. This money is to be used towards purchasing apparel and business items that proudly display our Varen Technologies corporate logo. Varen’s Commitment to the Community – Bike teams for charity, AFCEA events, support for Dogs for Deployment are all part of our repertoire to support our community.